From CALL, to ICALL, to MALL, to RALL, oh how we’ve moved on! The pioneering drill and practice CALL (Computer Assisted Language Learning) computer programmes that dominated the style of learning in the 60’s and 70’s has witnessed many changes. The 1980’s brought about the first radical change in the form of ICALL (Intelligent Computer Assisted Language Learning), where NLP (Natural Language Processing) help computers understand the structure of human language in order to be able to generate it from a computational data structure. Dramatic shifts in our electronic environment has resulted in mobile technology navigating our learning environment and MALL (Mobile Assisted Language Learning) is becoming ever more popular as educators incorporate smartphones and tablets into their teaching practice. This form of mobile technology also extends to RALL (Robot Assisted Language Learning). Humanoid robots are already being used for educational purposes and language learning in the US, Japan, and Korea. Japan and the US are using robots as peer tutors, while Korea is using them as teaching assistants and “friends” to generate motivation and increase learning achievement. In the US and Korea the robots use visual instructional materials while in Japan the interaction is gesture and voice-based. Unsurprisingly, RALL is already in full swing in Korea. 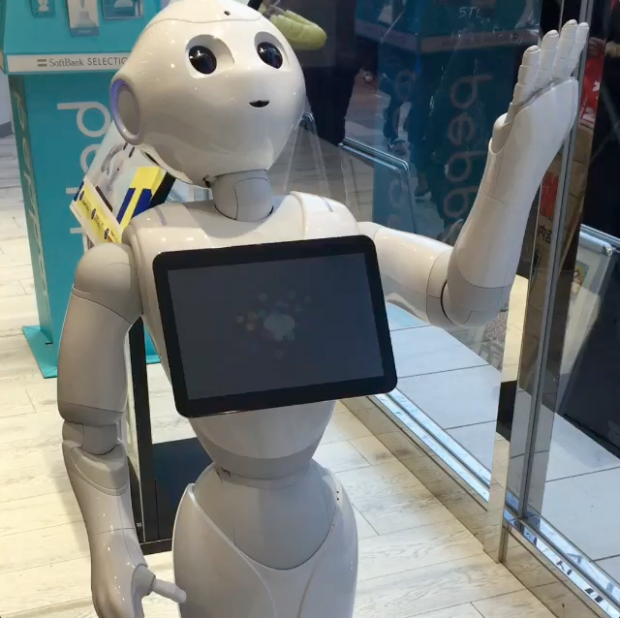 iRobiQ is an example of an anthropomorphized robot which has been developed with a face, and a tablet interface attached to its chest like Pepper. The advantage of iRobiQ is the emphasis on education and language learning, whereas Pepper has been created for companionship. So just how long will it be before we start hanging out with humanoid robots in our staff rooms and teaching institutions I wonder?! Selfishly this week I have been trying to sneak humanoid robots into every aspect of my teaching. I am totally smitten with them, so I am reading extensively on the subject. One topic of discussion that naturally arose from some of the conversations I had with my students, was that of companion robots. In Japan, companion robots are filling many social gaps, the primary one being that of the increasing ageing population with a constant soaring demographic. 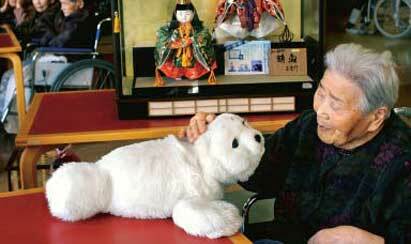 Other kinds of hope robots can offer in the spectrum of companionship is that of pets, like PARO the fluffy baby seal. PARO is marketed as a therapeutic robot, who claims to reduce stress and improve relationships between patients and their caregivers. Other pets include AIBO the robot dog, created by Sony in 1999. Perfect pet solutions without the maintenance a domestic pet requires. My first encounter with bioengineered or biorobotic androids was back in 1992, courtesy of Ridley Scott’s replicants in Blade Runner. Today, with the avalanche of digital learning platforms, apps, AI, VR, and AR, we are being flooded with practices of imitation learning while at the same time adaptive learning seeks to personalise learning experiences. Neural computation has been written about and researched since the 1940’s, and I was reminded of these technological advances on a recent trip to Japan, birthplace of Honda’s infamous Asimo. Can robots really replace humans, and in what capacity? Is it possible to perfectly clone the human biological neural network with artificial neural networks or neurodes? If so, to what extend, and what place do humanoid robots have in society? How will this affect teaching and learning and in which contexts? These are questions that I am going to research this year, so I will be sharing my ideas here. In the meantime, it’s Happy New Year from me and Happy New Year from Pepper.